Industry expositions provide a key connection between equipment manufacturers, importers and dealers with their end-user customers. In the past, construction Expos have tended to be geared towards the market for big machinery, local government and the mining industry. 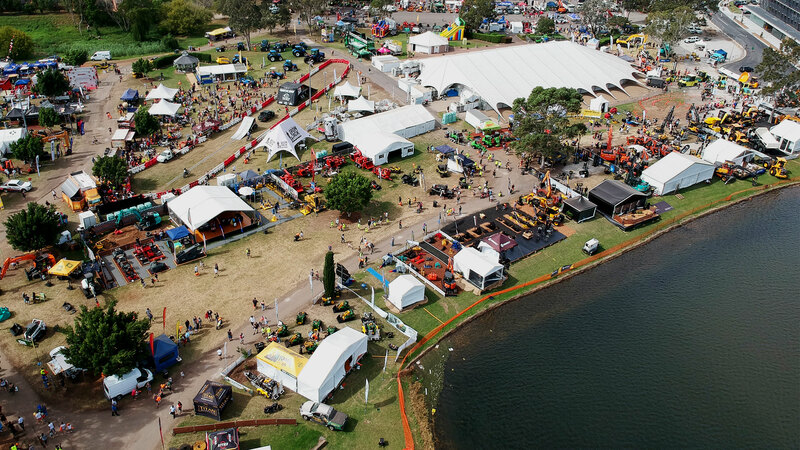 It was noted that regional city and farming field days still had a strong connection with dealers and end users, successfully interacting at all levels and inclusive of visitors’ families. The National Diesel Dirt & Turf Expo was established by Steve Zivkovich. His vision was to create a world-class event that had wide appeal for all members of the earthmoving, site preparation and construction and industry, their families, friends, colleagues and associates. The goal included the building of a platform for camaraderie, networking support for suppliers and contractors within the industry, as well is being a mutually beneficial place for the robust exchange of information, ideas and productivity solutions. Associate Sponsors: Auger Torque, Kinshofer, Hydraulink, Earthmovers & Excavators, Pages, Sydneywide Hire and iSeek. Wow, our very first show. When we opened the doors in 2016, we had no idea how many people would show up. By the end of the three days we counted 33,000 adults alone attending the first Diesel Dirt & Turf Expo. This was an exciting and monumental start to the Expo’s history. Talking to the crowd of visitors, their feedback was they loved the show, particularly the feel of a friendly field day coupled with the experience of being able to touch and “get up close and personal” with the machinery. Associate Sponsors: Kinshofer, 1800 Hose Van, Auger Torque, CreditOne, Graysonline, Pickles Auctions, Moody Kiddell, Hydraulic Steel, Kennards Hire, Doherty Couplers, Machines4u, Construction Sales, Hydraulink, Earthmovers & Excavators, Earthmoving Equipment magazine and Australian Earthmoving magazine. With the benefit of our experience from the first show, we saw an increase of 33 percent in the visitor attendance numbers. A major focus for 2017 was extending sponsorship arrangements to our Gold Sponsor and adding associate sponsorship to include our media partners and suppliers. The additional publicity generated by this move created an extended awareness of the show throughout the industry. Again, visitors responded positively to the event with some describing it as “amazing” with prizes, events, Pickles auctions and the machinery demonstration area. Audience engagement was high and feedback from exhibitors was extremely encouraging and positive. Associate Sponsors: Pickles, Auger Torque, Australian Earthmoving magazine, Earthmoving Equipment magazine , Hydraulic Steel, Kinshofer, Norm Engineering, Toro. The 2018 Diesel Dirt & Turf Expo was a roaring success. Adult visitor attendance rose by 56 percent over the previous year, with 76,750 people coming through the doors. Not only were the visitor numbers massive; exhibitors all reported an increase in traffic to their sites and in the quality and depth of customer engagement compared with the previous year. On the Sunday, the huge crowd was so large that for safety reasons we had to open the door early to allow entry. Again, 2018 gave us some major insights into traffic flow, structure and attractions that are being put in place for the 2019 show. Associate Sponsors: Pickles, Norm Engineering, STG Global, Earthmovers & Excavators, Deals On Wheels, Earthmoving Equipment, Australian Earthmoving, Calibre, Constructionsales.com, Sales, Hydraulink Steels Australia, Hogan Engineering, Roo Attachments, Epiroc,Penrith City Council, Digga and Toro. 2019 is promising to be the biggest show yet. Expo sites were almost completely booked out prior to the end of December 2018 and applications for sponsorships were coming thick and fast. Industry media has fully embraced the National Diesel Dirt &Turf Expo and promotion through their publications and digital media, along with a high visibility social media campaign and a new look website is going to make sure that everyone knows about the 2019 National Diesel Dirt &Turf Expo. The 2019 Expo will be huge!!! !